You are currently browsing the archives for the GarageSale category. 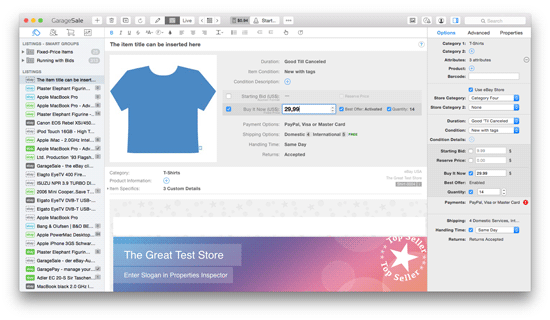 Today we are releasing GarageSale 7.0.8, an updated version of our eBay listing solution for the Mac. You can grab it from our download page. Besides a number of smaller improvements and bug fixes (see here of a detailed list of changes), this update makes GarageSale compatible with eBay's upcoming listing policy updates. Most importantly, pictures uploaded to GarageSale's free image hosting service are now embedded into your listing's description using the HTTPS protocol. If you are using GarageSale to upload images to your own server, please make sure your server is able to deliver your images via the HTTPS protocol. You can find out more information about this in this thread on the GarageSale user forum. This weekend (to be exact: through November 28th), you can save 30% off GarageSale 7 licenses*. Use coupon code 2016THIRTY to save. Just download GarageSale and select the “Buy License” command. And of course, you can share this coupon with your friends, and families. Everyone has something that’s better put on eBay than rotting away in some closet! GarageSale 7 is out now! After more then 10 years working on GarageSale for OS X (version 1.0 was released in November 2004), we realized that eBay, OS X aka macOS, and the expectations of our users had changed in so many ways, that GarageSale’s original architecture wouldn’t take us any further. GarageSale 7 offers a modern user interface, which helps you listing your items on eBay faster by providing instant error feedback while composing your listing. The new GarageSale Scout companion app for iOS lets you quickly take picture of your items without needing to go through Photos app or PhotoStream. Previous GarageSale versions offered “listing templates” and “auctions” as primary objects. While this concept worked great for some users, other sellers were confused. GarageSale 7 only offers “listings” objects for tracking a listing on eBay. The main reasons for this change are explained here. We built a custom database layer on top of Google’s LevelDB engine, that scales better for sellers with a large number of listings and orders, and also lets us update GarageSale faster than the technology we were using in older versions. The result of all this work is GarageSale 7, which we are proudly releasing to the world today. You can download it from this link. As always, the unlicensed version is good for starting three listings on eBay. GarageSale 7 is a paid upgrade from any previous version of GarageSale. The upgrade costs USD/EUR 19.99. Upgrade licenses are available from within GarageSale 7. If you purchased your GarageSale 6 license after August 1st 2015, you are eligible for a free upgrade to GarageSale 7. GarageSale 7 will offer you a free license once you start the purchase flow within the application. GarageSale 7 license is available for USD/EUR 39.99 and can be obtained from within the application. More pricing details are available here. GarageSale is localized in English, German, Italian, and French. If you have comments, suggestions, or questions please post them to our user group (English preferred) or contact us in private (English or German). For the past two years we’ve been pouring our hearts and souls into an entirely new version of GarageSale for OS X. It’s called GarageSale 7, and it will make managing your eBay business from your Mac easier and more pleasant than ever. Before the final release of GarageSale 7 (sometime in the next few weeks), we’re looking for more feedback from testers on Mac OS X 10.10 (Yosemite) or Mac OS X 10.11 (El Capitan) to try it out. If you have a few minutes to spare, please give GarageSale 7 a try. Your GarageSale 6 installation will not be altered by trying out GarageSale 7. GarageSale 6.9.7 is out. It fixes a problem that could cause a crash when using GarageSale’s Preview mode under OS X El Capitan/10.11. Downloaded it from this page. This version has also been submitted to Mac App Store for review and should be available in a few days. Please edit your eBay listing in “Editor” mode until the updated version is approved and released by Apple.